Asbach Pralinen Uralt Brandy. 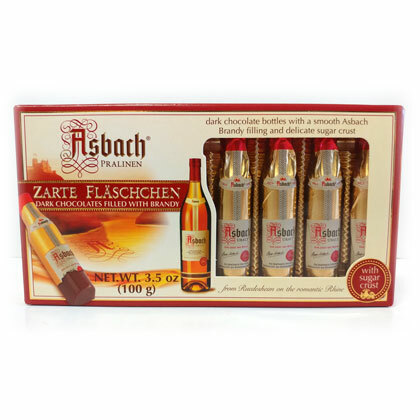 8 filled bottle shaped chocolates with a liquid Asbach Brandy filling enrobed with finest bittersweet chocolate with sugar crust. Recognized by connoisseurs to be the ultimate in liquor filled chocolates. Product of Germany. 3.5 ounce gift box. Approx. 8 inches wide and 4 inches tall. MUST BE 21.